This is sharp cheddar without the training wheels. Creamy white in color with an almost crumbly texture, it has a sophisticated citrusy tang. We like to say that it is an introduction to the "East Coast Cheddar Bite". A stellar snacking cheese paired with roasted nuts and ice-cold ale. Make no mistake, this cheddar is also excellent for cooking: A little goes a long "whey" when you melt it into cheese sauce. And a few slices of Lactose-Free Extra Sharp will turn a simple burger into a work of art. ON SALE! BUY 3 or MORE 8 oz BARS AND SAVE!! 1. Place rack in upper third of oven and preheat oven to 500Â°F. 2. In large bowl, combine beef and cheddar; scatter salt and pepper over top. Gently work mixture together until well combined. 3. Divide mixture into quarters and shape each quarter into six (1 1/4-inch) balls, for a total of 24 balls. 4. Wrap each ball in a half slice bacon, pressing into patty shape. Arrange patties on large baking sheet. 5. Bake for 5 to 8 minutes or until internal temperature reaches 160Â°F. Loosen from baking sheet with spatula. 6. Cut each roll crosswise into 4 sections to make mini-buns. Place some arugula or watercress in each, topped with mini-burger and small dollop of Chipotle Aioli. 1. In small bowl, whisk together all ingredients. Serve immediately, or cover and refrigerate for up to 2 weeks. 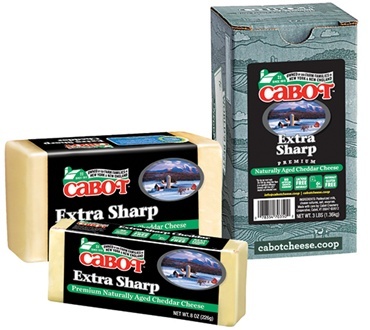 Cabbot cheese is the best!! Well it's not too dry like many white cheddars. I really enjoy and look forward to a simple plate of it with some almonds, a nice vodka and ice water between bites. I'm normally a big eater. It's rare to experience something where I enjoy the flavor so much I'm completely satisfied eating much less than I normally would. BEST CHEESE EVER! Many friends have started buying! Terrific cheese ANY time--DAY OR NIGHT! EVEN MIDNIGHT SNACK!!!! !